Advance medical directives are documents you can write to show doctors and everyone else what sort of treatment you want to receive in the future. These documents are a valuable planning tool because you could find yourself in the unfortunate position of being unable to communicate effectively. Without the document in that case, a court would appoint a guardian to make decisions for you, and you could receive care that you never desired. 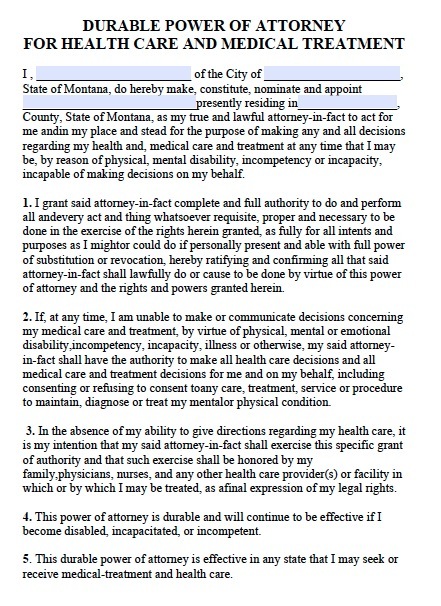 A durable power of attorney for health care in Montana allows you to name someone else as a healthcare proxy to make most any decision for you. For example, if there are two procedures that could be performed to improve your condition, and one is riskier but produces a better result, the proxy would decide which treatment to undergo after consulting with doctors. If a doctor determines that you have become terminally ill with no chance of recovery, and you cannot communicate, a living will written beforehand can specify whether you want to receive life-support treatments like artificial hydration and mechanical breathing, or whether you’d prefer to die naturally. A living will must be signed by two witnesses in Montana.